“I get people coming in here, asking what soaps work best to treat acne, eczema, psoriasis … and I tell them, any of our soaps will work. It’s probably whatever soap you’re using now, with all these chemicals, that are causing or aggravating the problem.” And so begins our Editor’s education about soap and healthy skin, thanks to Phil Metzler of Glenn Avenue Soap. Phil and his wife Sandra, have been making soaps for roughly 8 years. Many of those years were spent making soap in their own home, but they recently opened Glenn Avenue Soap. The space doubles as retail and production, with customers get a full view of the soap making process right when they walk in. 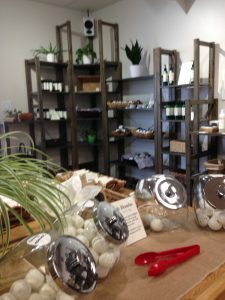 Our Cbus Chic Editor wanted to learn more about Glenn Ave and how they make their soaps. So she headed over this week to get a tour of the store and talk with co-owner Phil Metzler. While there, she learned how you make soap, Glenn Ave’s dedication to natural products, what goes into their beer soap, plus some hints at products coming soon. Glenn Avenue Soap opened this year in February, around Valentine’s Day. Since then, they’re been steadily growing. Their soaps are in over 50 locations around Columbus and Central Ohio; from restaurants and coffee shops, to doctor’s offices and daycares. The thing that makes Glenn Ave Soap so appealing, according to Metzler, is their products dedication to being natural and organic. It’s all about the honest and natural ingredients. That’s what makes the difference for Glenn Ave. You won’t find any ‘Candy Cane’ or ‘Tropical Beach Breeze’ at Glenn Ave. Instead you’l find a selection of scents and skincare products with easy-to-identify names like pine, orange, lavender, and basil. There’s also no square soaps at Glenn Ave. Metzler added. Sandra, his wife and co-owner, prefers round and oval shapes because they fit in your hand better. That’s the kind of organic and natural experience Glenn Ave. wants for its customers. Glenn Ave. is always known for their line of beer soaps, made with beers from local breweries. You can bathe yourself with suds from brews by Seventh Son, Zauber, Wolf’s Ridge, Mad Moon, Actual Brewing, and more (note: our Editor is currently enjoying the Wolf’s Ridge IPA Chai). Our Editor got a little info on how Glenn Ave. makes these speciality soaps and the secret is: flat beer. Instead of using water during saponification, you substitute it with the beer. But is has to be flat, “otherwise, because of the carbonation, you’d get a beer volcano when it mixes with the lye,” Metlzer explains. 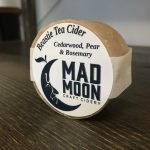 You can pick up some the beer soap, along with their other products like face wash, bath bombs, and foaming hand soap, one of three ways: Etsy, online, or storefront (1166 W. 5th Ave. – Grandview). Be sure to keep an eye out for new products they’ll be launching this holiday season and next year, like a line of essential oils and baby skincare. And as always, you can learn more about Glenn Avenue Soap by visiting them online at www.glennavesoap.com and following them on Facebook and Instagram: @glennavesoap.